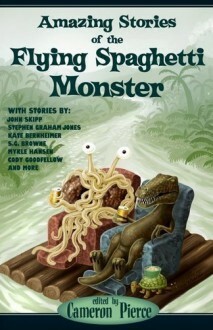 On the seventh day, the Flying Spaghetti Monster said, "Read me, for I am good." In Amazing Stories, the Flying Spaghetti Monster goes on trial to earn his godhood among a council of deities that includes Jehovah, the Buddha, Ganesh, Cthulhu, and Charlie Sheen. He is interviewed for an exclusive episode of the celebrity talk show In the Monster's Studio to discuss his relationship with Godzilla and other famous monsters. He rears his head at an archeological dig in a desert wasteland and dines with a horde of food demons in Hell. He rescues pirates, authors, and prisoners from the cold hand of death while banishing children to suffering and starvation. He is a just god, but only if you compliment his vodka sauce. Like an all-spaghetti evening of Adult Swim, Amazing Stories of the Flying Spaghetti Monster will show you the many realms of His Noodly Appendage. Learn of those who worship him and the lives he touches in distant, mysterious ways. Enjoy with Italian food and a side of Darwinism.Featuring stories by John Skipp, Stephen Graham Jones, Kate Bernheimer, S.G. Browne, Cody Goodfellow, Mykle Hansen, Kevin L. Donihe, Bradley Sands, Jeffrey Thomas, Kelli Owen, and many more.